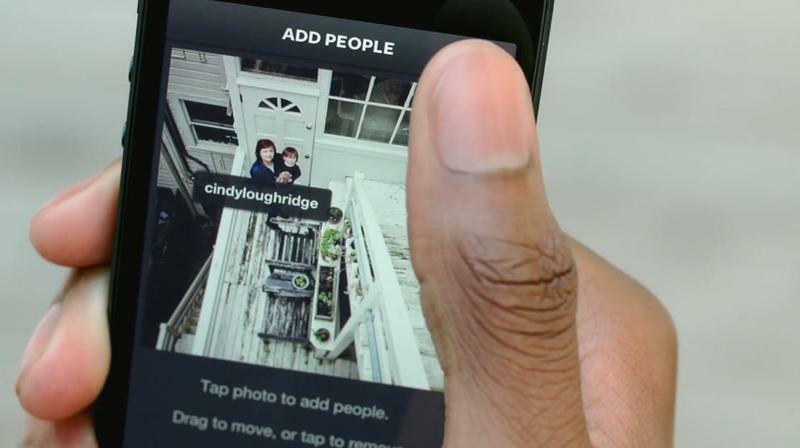 Instagram got a small dose of Facebook on Thursday, with an update that allows users to tag their friends in photos. No more @ mentions. It’s exactly the same experience you’d find when sifting through albums in Zuckerberg’s online friend palace. Once you update, a new section on your profile will be added, called “Photos of You,” which displays every photo you’ve been tagged in in Instagram’s familiar grid layout. Adding tags to existing or new photos is simple, and there’s actually plenty of control handed over to set precise security guidelines and where in the photo the tag appears. When adding a new photo, you’ll see an option to add people just under the caption area, where you simply type in and click on a friend’s name. A small bubble tag of that friend’s Instagram name will show up, which you can then drag around to a position of your choosing. Once a photo is tagged, you’ll see a small profile badge toward the photo’s bottom left corner indicating people (or brands) have been tagged. Tap once on the photo and you’ll see each person’s username appear in little bubbles. Tap again and the small bubbles will disappear. The username(s) that do popup are clickable, and bring you to that person’s or brand’s profile. 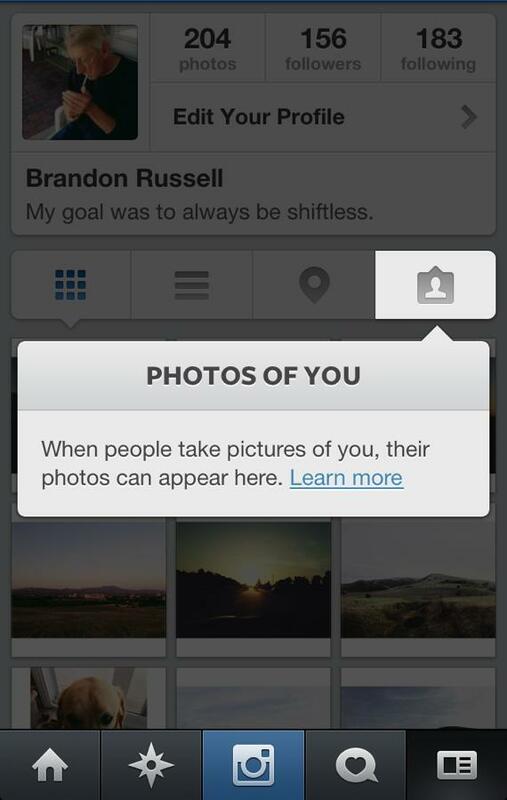 This, of course, will make it easier to discover more people to follow, and see pictures of friends tagged by others. If you do tag a friend, or visa versa, you’ll get a notification, and that photo will automatically show up in your Photos of You feed. Instagram says all photos you’re tagged in will be visible to everyone that visits your profile starting May 16 (or you can activate that now). 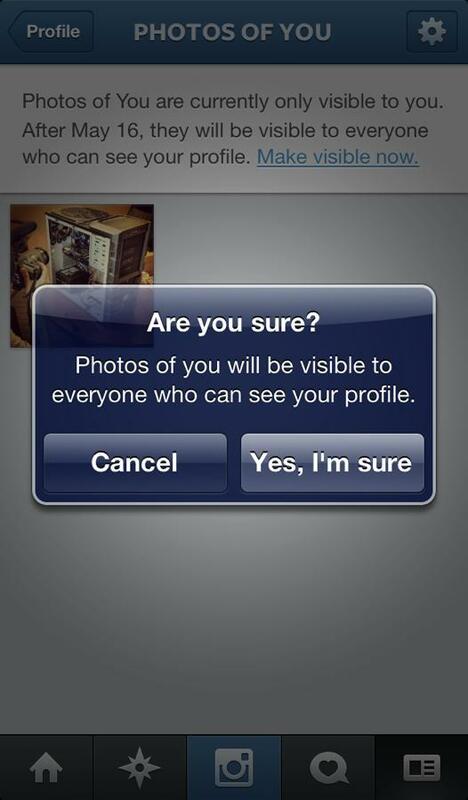 However, the company does hand over plenty of control if you don’t want people snooping (but refuse to make your profile private). 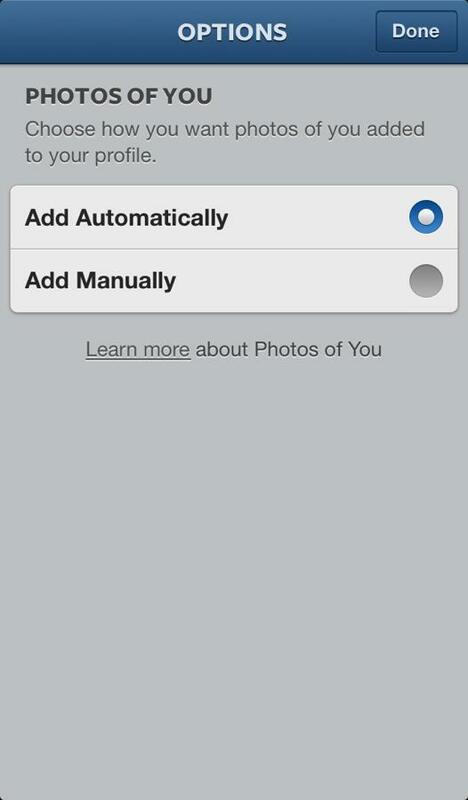 You can hide photos from your profile, remove yourself from a photo and also click on an option to add tagged photos manually, ensuring you don’t get spammed. 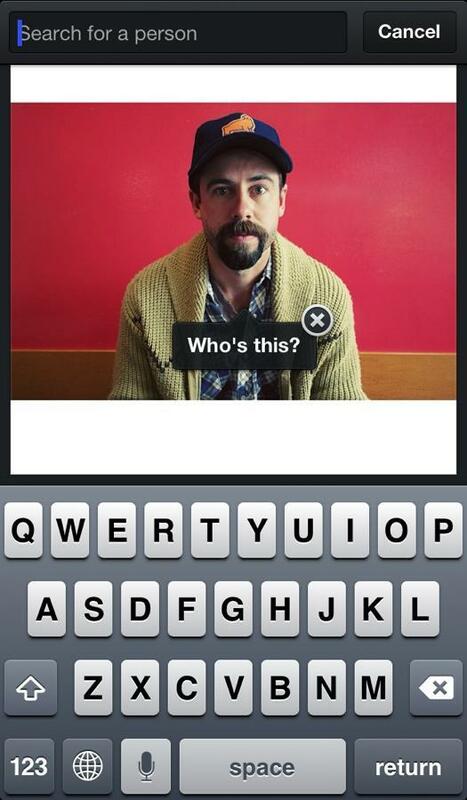 The ability to easily tag friends in photos is great, and adds more seamless social functionality. It’s definitely nice that there’s a system in place that deters spamming, too, so hopefully tag spammers don’t run rampant. 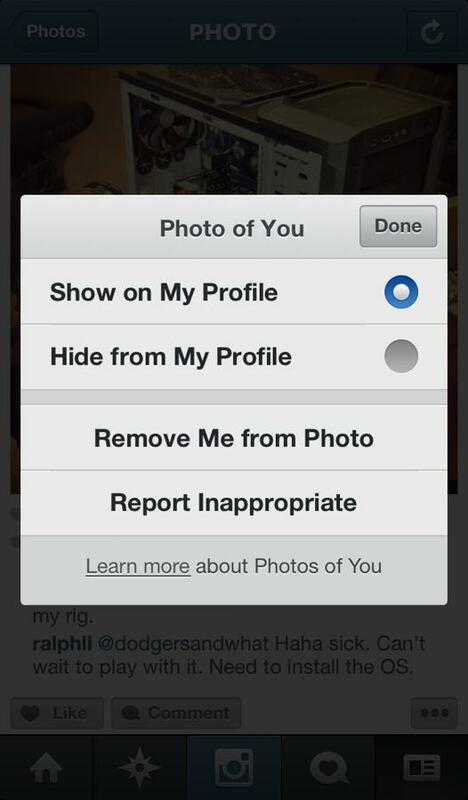 Right now you can’t tag a photo on someone else’s profile; only the person who uploaded the photo can do that. And, according to Instagram’s terms, save for someone you’ve blocked, anyone can tag you in a photo (assuming they follow you). The @ mention system remains unchanged, so you can still upload a photo of a tree and mention a friend so they’ll see it. 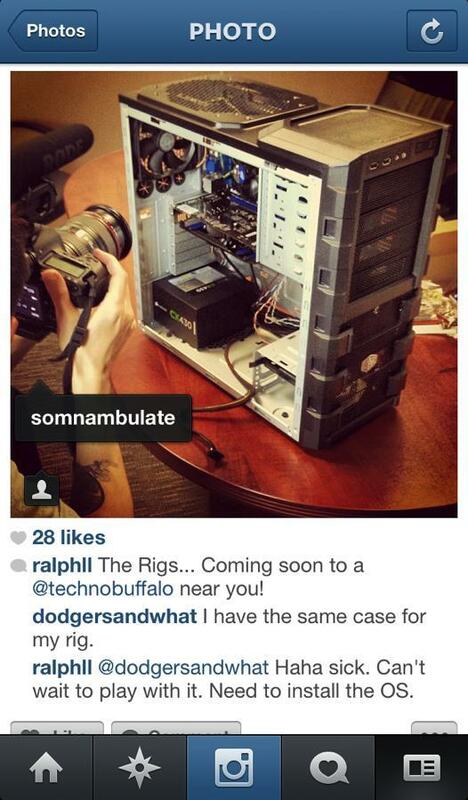 Tagging friends is a much easier and long-term way to aggregate your life and interactions. Instead of digging through your feed for an old photo you took with a friend at the hockey game, it’s now in its own section right there on your profile (and your friend’s). The addition is simple, but adds one of Facebook’s best features. Instagram has done up a neat little video demonstrating the new tagging system in action, so be sure to check that out before you start mercilessly tagging away. The update is available now for both iOS and Android devices.